I feel compelled as a native NJ'er to share my opinion on the NFL's cockamamie decision to have the Super Bowl in East Rutherford, NJ in 2014. I've never liked this idea, going back to long before the new stadium was built and people started murmuring about it as something that could be done for the NY area "because of 9/11." First of all, invoking 9/11 doesn't make you a caring person. It's lazy and it's a way to try to make yourself look considerate. Holding a Super Bowl there more than 12 years after that awful day has zero to do with one another. No, this is about the NFL kissing asses. The NFL gave Dallas a Super Bowl because of Jerry Jones' giant compensation stadium. So when the Giants/Jets built a new stadium, why not give them one, too? And do you know why the owners all think it's a swell idea? Because people like Robert Kraft and Daniel Snyder will now surely make requests to hold Super Bowls in their own new-ish buildings. Hey, you let New Jersey host one, Mr. Commissioner. And so now we'll have to deal with this. Sure, many Super Bowls will still be played in warm climates. It's unlikely that Miami, New Orleans, Tampa and the like will ever be fully phased out. But it's not impossible. Consider that Miami's stadium is currently 23 years old. The Superdome in New Orleans is 35 years old. That's as old as Boilerdowd, and he can't play softball without hurting himself, no matter how many handsome young men are there to help him up. No, this is a slippery slope. Cases will be made that the Super Bowl should be in the best, most state-of-the-art stadiums each year.... and I can't necessarily say that's not a solid argument. But now that they're willing to put games in the snow belt, well, have fun with that. Oh, and my biggest concern about this isn't snow, despite the photos in this post. No, if you've ever been to a game at the Meadowlands, you know how fiercely windy it can get. Like, ridiculously so. Like, ten yard punt bad. Unable to make field goals or throw the ball bad. So, yeah, it's not so much that it might be cold and snowy as it is the likelihood that it will be nasty and windy. I heard on NY radio that of the past ten years, on Feb 2 (the date of the 2014 Super Bowl), it's been over 50 degrees six times. That's good. You know what else happens in February, though? Some of the worst winter storms NJ ever has. So it's totally hit or miss. And yeah, if it turns out to be 55 degrees and clear, everyone will act like "See, no problem!" Except why would you want to hope for a lucky weather day for your biggest showcase event if you're the NFL? Oh, right. Money. And don't tell me it's for the fans. The Super Bowl is too expensive for most fans, plus there are few seats even available. Most go to corporate types or people with media connections. And those people -- non-real football fans -- don't want to be miserable and cold, even if that makes for nifty photographs of the game. 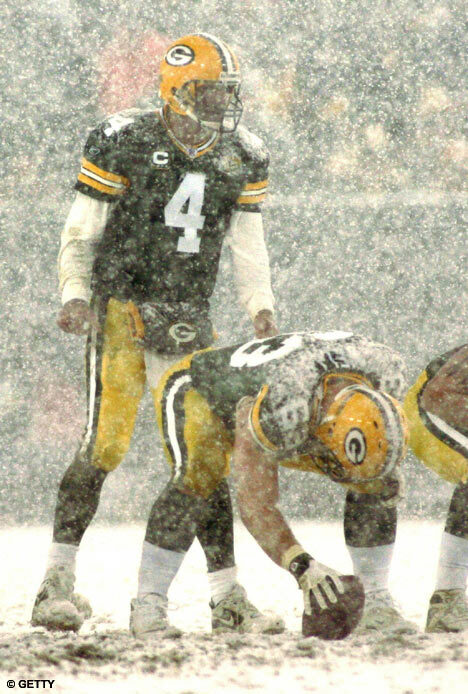 People talk about the "Ice Bowl" like it is some nostalgic thing. The Ice Bowl sucked! It was -17 degrees! It's one of the reasons there was actually a rule on the books about the Super Bowl having to be played in climates above 50 degrees. I don't want to see a Super Bowl affected by snow or wind or whatever. Yeah, yeah, I know it rained on the Colts-Bears Super Bowl in Miami. Whoop-dee-do. It was also probably 70 degrees. And that's extraordinarily rare. To point to that as an example of how weather interferes is like saying you shouldn't hold the Orange Bowl in Florida anymore because last year's was played in 30 degree weather. It was a fluke. This is a bad move by the NFL. Part of the fun of the Super Bowl is watching things happening in nicer climates and wishing we were there. Being envious of it. In NJ? Hell, I'm from there and it's the last place I'd want to be in February. And if people bitched about how hard it was to get from place to place when the Super Bowl was in Houston, well, prepare yourselves for the hell of getting in and out of Manhattan for a week. And shuffling back and forth from the Meadowlands to wherever your hotel is in NYC. I hope the NFL gets what it deserves on this one.